Jim was a great appreciator of all types of music and looked for ways to incorporate an immense range of styles into his work. In the 1950s, he raided the NBC music library for interesting tracks to perform to on Sam and Friends. In the 1960s, he collaborated with jazz musicians and electronic music composers to create scores for his experimental films, often linking the sounds to the visuals in a unique and arresting way. 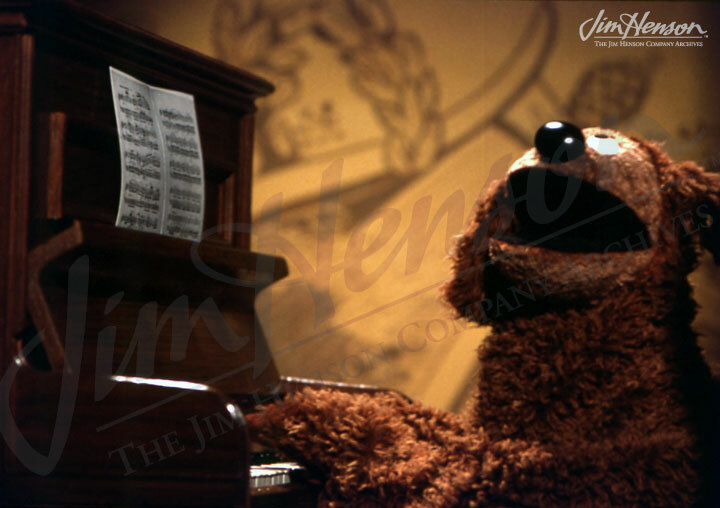 The 1970s meant important work with his Sesame Street musical colleagues, Joe Raposo and Jeff Moss, on classics like “Bein’ Green” or “Rubber Duckie,” and the extraordinary relationship with Paul Williams who composed the music for Emmet Otter and The Muppet Movie. From opera to country, musicians of all stripes were represented on The Muppet Show, and Jim loved working with the inventive David Bowie on his songs for Labyrinth. During the 1980s, Jim also enjoyed the development of orchestral scores with Trevor Jones for Jim’s fantasy films, and he brought in up and coming composer Rachel Portman for his Storyteller project. The Ghost of Faffner Hall, Jim’s music education series, was yet another opportunity for him to showcase all types of music and celebrate its creation. Learn more about The Ghost of Faffner Hall. Jim’s musical alter ego Rowlf. This entry was posted in 08-August '88, 1988, Ghost of Faffner Hall and tagged David Bowie, Emmet Otter, Jeff Moss, Joe Raposo, Labyrinth, Paul Williams, Rachel Portman, Sam and Friends, Sesame Street, Storyteller, The Muppet Movie, The Muppet Show, Trevor Jones. Bookmark the permalink.